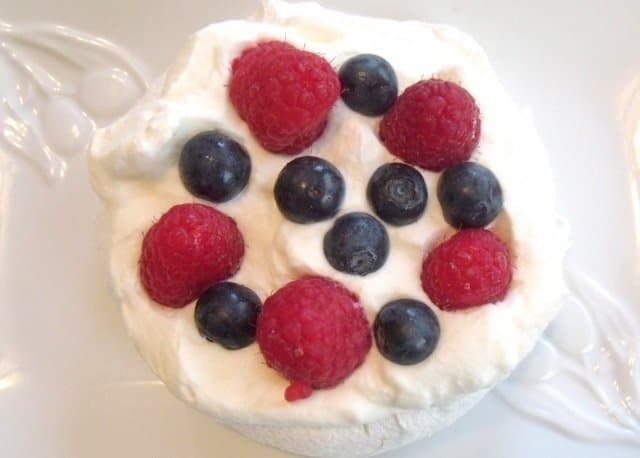 Pavlova is a favorite Irish dessert, with fresh fruit and whipped cream used to decorate a meringue base. It’s crisp, sweet crust contrasts deliciously with a soft, light center. Pavlova was created in either Australia or New Zealand in the 1920’s to commemorate a visit by Anna Pavlova, the famous Russian ballet dancer. A taste for this delicate dessert spread throughout the United Kingdom and it’s commonwealth, and was even embraced by the Irish. I know many cooks shy away from making this delicacy because of the slow, complicated process required to achieve a perfect meringue consistency. 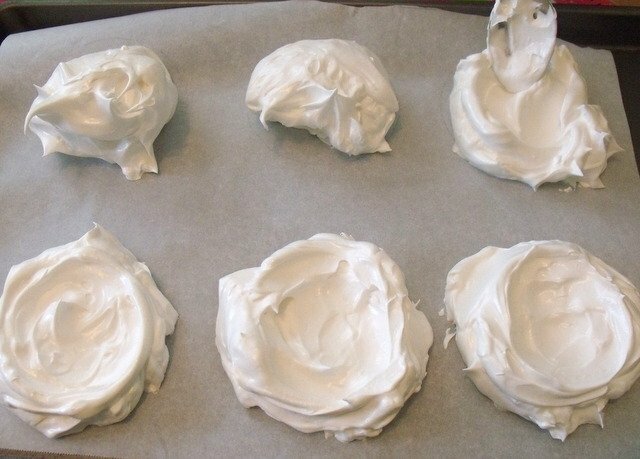 When I first made pavlovas I stuck to the step-by-step recipe of olden days. 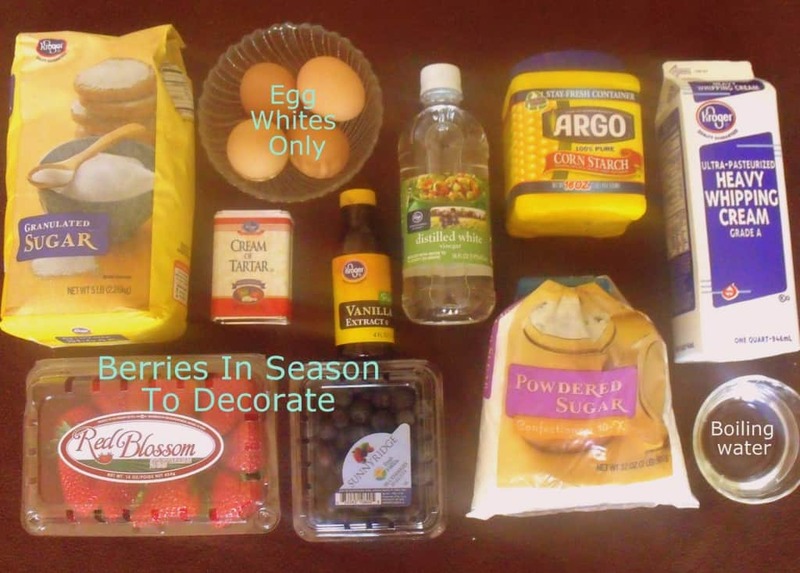 Using this tried and true approach I beat egg whites with cream of tartar until stiff, then added sugar spoon-by-spoon in a time-consuming way. Then I carefully folded in corn starch and white vinegar, before creatively piping the finished product onto a baking sheet. Worry no more. I have simplified the whole process. 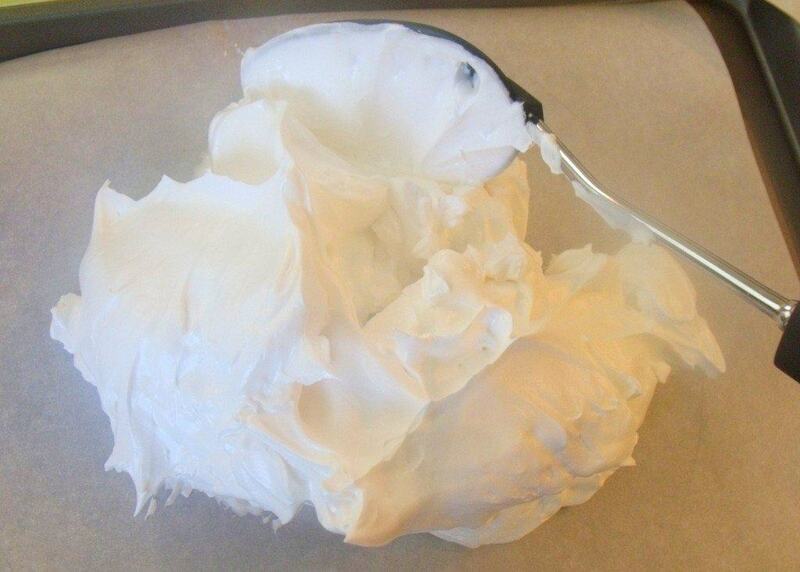 I now make my pavlovas using a one-step, toss-it-in-the-bowl, and beat-it-all-up method. 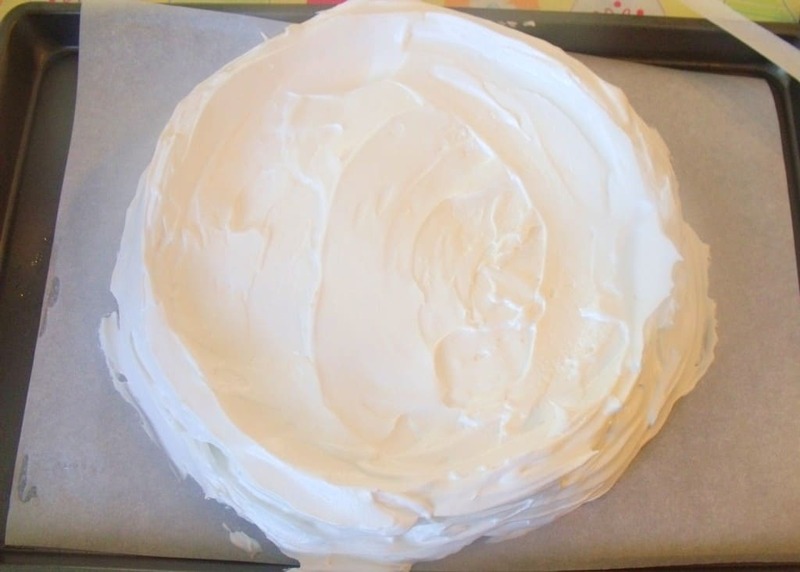 My pavlovas turn out just as good today as when I used the pain-staking technique of old. 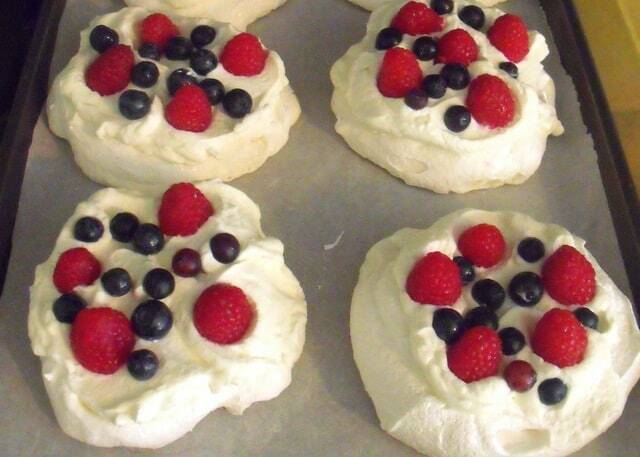 Here is my easy recipe for mini pavlovas, or pavlova nests as some may like to call them. Before getting started pre-heat the oven to 250 degrees Fahrenheit. 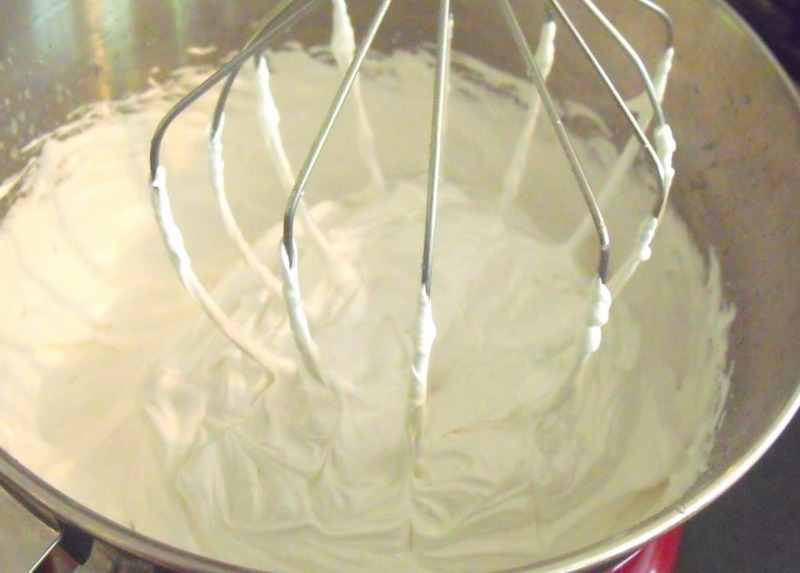 Separate the egg whites and place them in a large mixing bowl. Add the sugar. Toss in the vanilla, white vinegar, cream of tartar and corn starch. Add 4 tablespoons of boiling water, careful not to burn your finger tips. This, I believe, is the secret ingredient for successful one-step pavlovas. Set the mixer beating and while you are waiting you can prepare the baking sheets. If you don’t have a stand alone mixer and need to hold yours, make sure you prepare the baking sheets before beating the meringue. Line two large baking sheets with parchment paper. 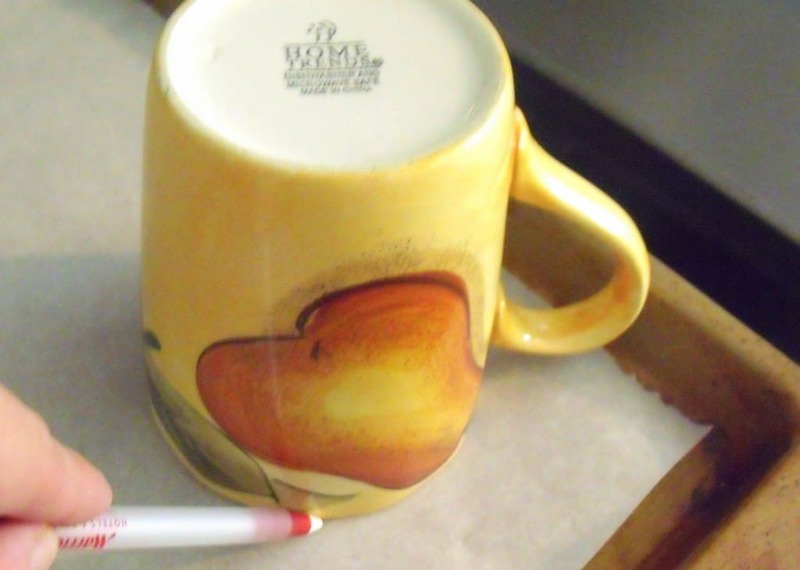 Take a cup or a glass and mark the perimeter with a pen. 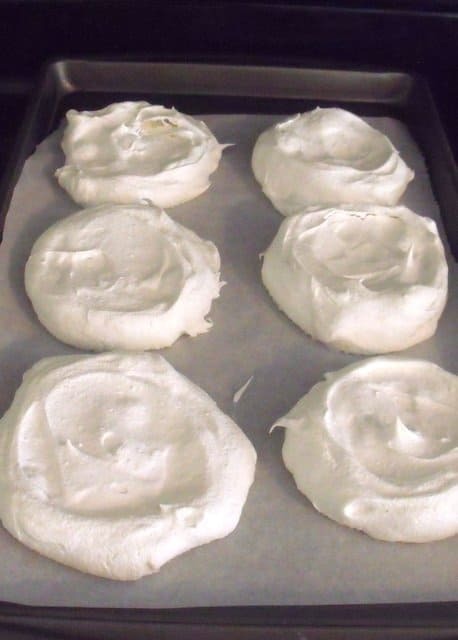 Create 6 circles on each baking sheet 2 to 3 inches apart, for a total of 12 mini-pavlova nests. Next turn the paper upside-down, so the pen does not leach into the meringue mixture. The guiding circles should still be visible. 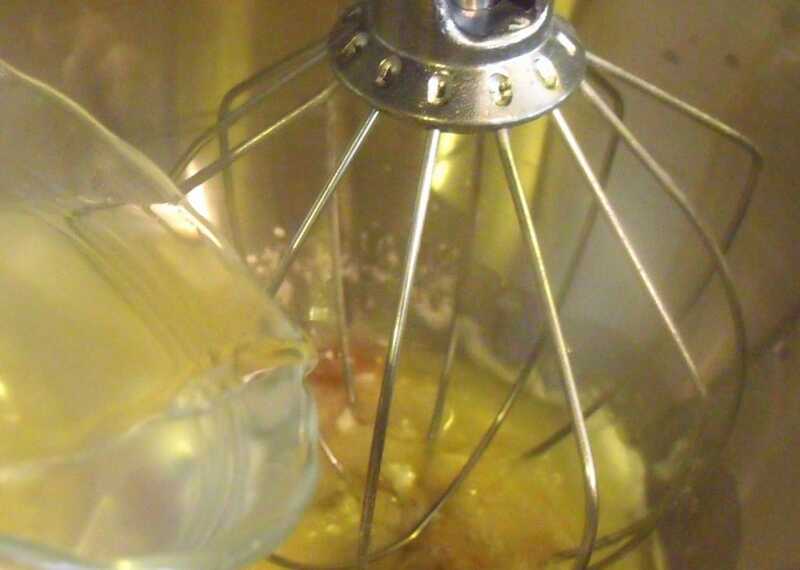 The time required to beat the egg white mixture varies depending upon the power of your mixer. Mine took 7 minutes, but my mixer is pretty powerful. Next, spoon the egg white mixture onto the pre-marked circles. 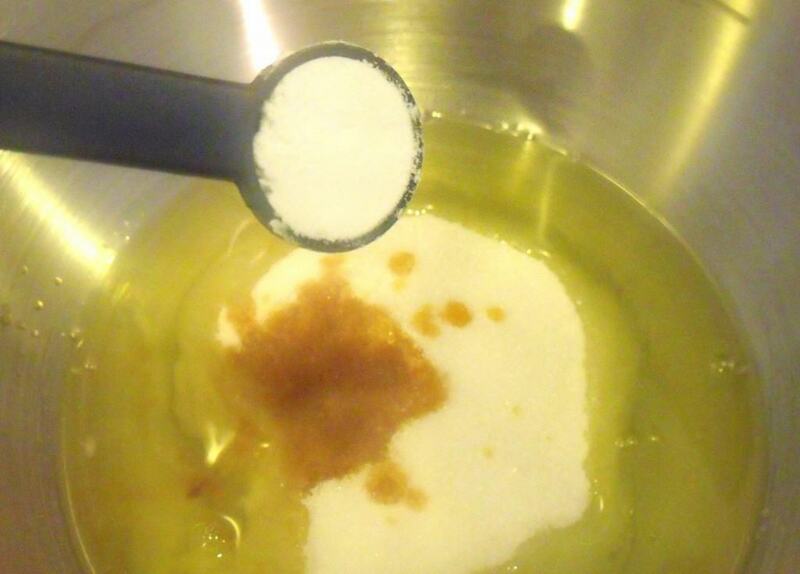 A large mixing spoon helps divide the mixture into 12 equal portions. Now comes the fun. Using the back of a dessert spoon, start smoothing the upper surface of each nest working from the center out to the edges. Create a little lip on the perimeter of each nest. This will help hold the cream and fruit when you decorate the pavlovas later. Work all 12 mounds into a nest shape. Bake both trays together in the pre-heated 250 degree Fahrenheit oven for 60 minutes, then reduce the heat to 225 degrees for an additional 30 minutes. 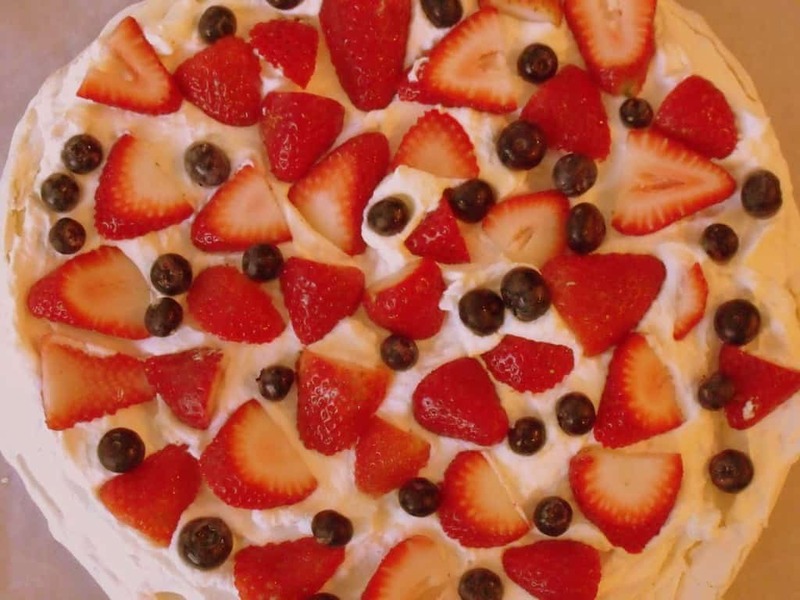 Other pavlova recipes call for a hotter oven with a reduced cooking time. 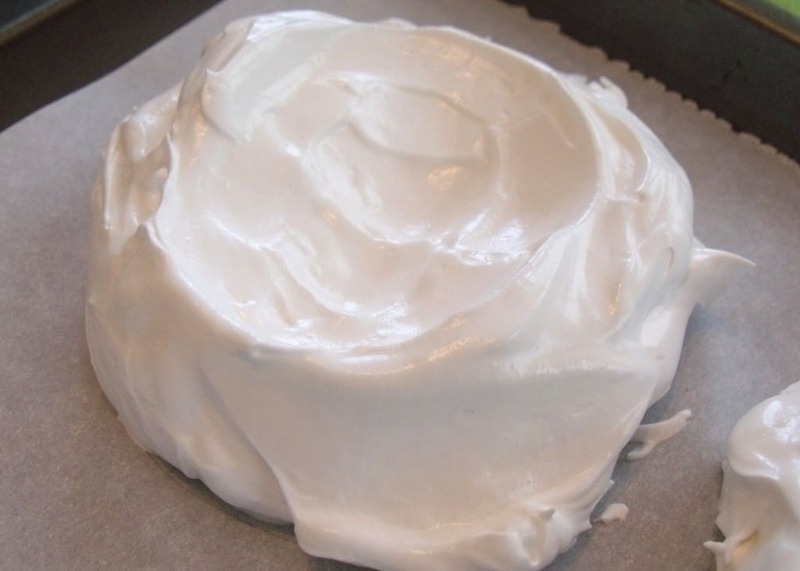 I have always found that low and slow is the best way to cook any pavlova or meringue. (I’ll share my meringue recipe another time). When the pavlovas are cooked turn the oven off. Open the door slightly and allow them to cool in the oven. Slow cooling is best to create a crispy outer crust. Never cool a meringue in the fridge. This will cause them to weep a sticky, orange goo. When they are fully cooled its time to decorate. Whip the cream until thick. 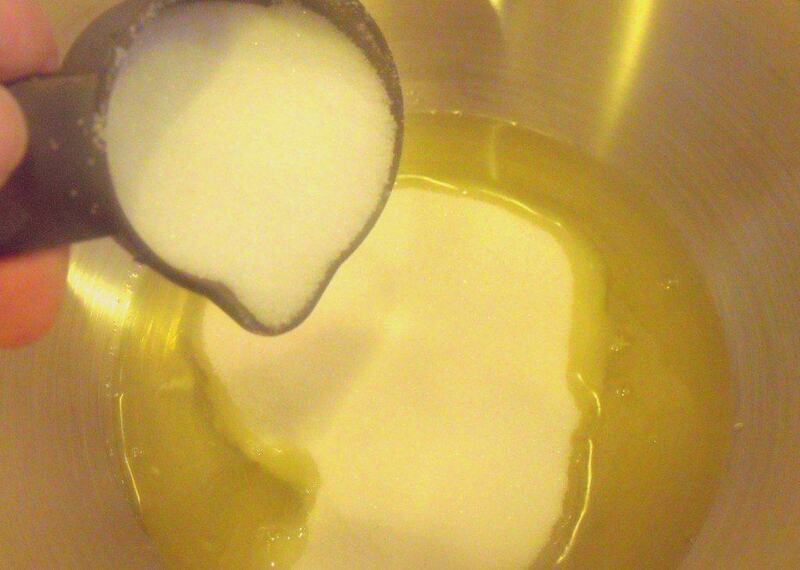 Add sugar to sweeten if desired. Fill each mini pavlova with fresh cream and decorate with the fresh fruit of your choice. Raspberries and blueberries are my favorite. They really are as good as they look – one of my all time favorite desserts. I like to make these mini pavlova nests since it makes serving a breeze. There is less risk of cracking smaller shells as you lift them off the parchment paper. Also presentation is easier than with a larger pavlova, since you don’t have to contend with a cracking crust as you cut each slice. However, if you prefer one large pavlova, this recipe works just great. Here’s how to make a few changes to create one stunning dessert. 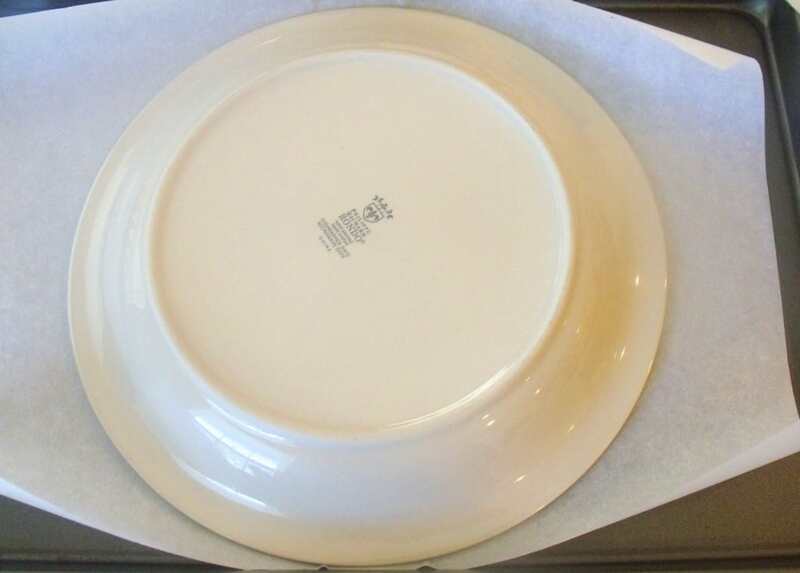 Instead of using a cup to mark 12 mini circles, just use a regular dinner plate to mark a large circle on the parchment paper. Again, remember to turn the pen-side under before transferring the meringue mixture. Spoon all of the beaten egg white mixture onto the large circle on the baking sheet lined with parchment paper. Use the back of a spoon to smooth out the top, creating a small lip around the perimeter. Then bake it exactly as above – low and slow for best results. When fully cooled just decorate it with whipped cream and fresh fruit. You can make a beautiful, symmetrical pattern, or just go crazy and spread the fruit around all higglety pigglety like I do. Delicious whichever method you choose. 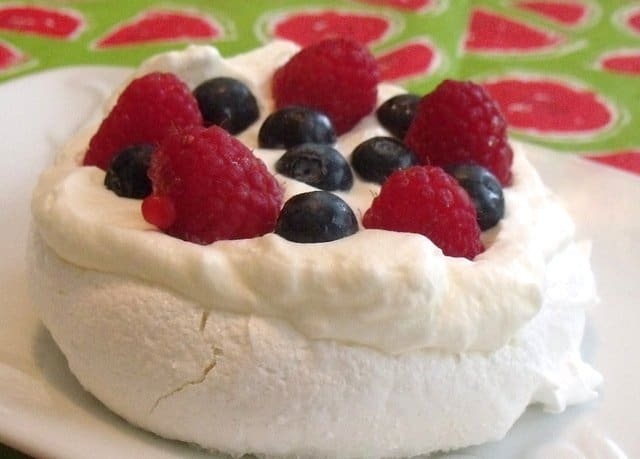 Pavlova is a favorite British and Australian dessert, with fresh fruit and whipped cream used to decorate a meringue base. It's crisp sweet, crust contrasts deliciously with a soft, light center. Step 1 Preheat the oven to 250 degrees Fahrenheit. Step 2 Line two large baking sheets with parchment paper. Use a pen to trace the perimeter of a glass or cup 6 times on each sheet of parchment. Turn the papers upside-down. The guiding outline should still be visible on the clean side of the paper. Step 3 Add all of the ingredients into a large mixing bowl and beat using an electric mixer until thick and the egg whites form stiff peaks. The meringue will be satiny, and gleaming white. Step 4 Spoon the meringue mixture onto the 12 pre-marked circles on the parchment paper. Step 5 Using the back of a spoon smooth the top of each pavlova nest, working from the center to the perimeter, and making the edge slightly higher to form a nest. Step 6 Bake in the pre-heated 250 degree Fahrenheit oven for 60 minutes, then reduce the heat to 225 degrees Fahrenheit for an additional 30 minutes. Step 7 Turn the oven off. Leave the pavlovas to cool in the oven with the door slightly ajar. Step 8 Fill with whipped cream and your fruit of choice to serve. Wishing you all happy pavlova baking! Love Love pavlova and meringues but how long will they stay good after you decorate them? how do you store them before decorating? Hi Cindy – After decorating the meringues they can be stored in an airtight container in the fridge, and will last a day or two. How long the cream remains fresh is the main factor in determining how long they last. I don’t decorate my meringues until I am ready to serve them. When they have fully cooled it is important to keep them in a cool and dry environment. If left out they will absorb moisture from the air and start to weep. Keep them in an airtight container with a lid. The fridge is fine for storing them once they have fully cooled. Once they are kept cool and dry they can last up to a week. Mine have never survived more than a week for me to know if they could stay fresh any longer. Thanks for visiting and happy baking. 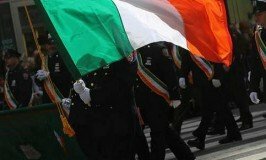 I’m going to give you a parade! And GUESS WHAT, it is GLUTEN FREE!!! YAY!! I love you1 I’ve always wanted to make meringues for Richard, but didn’t think that I could. 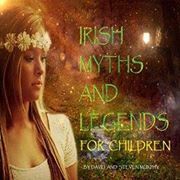 Cheryl – Pavlovlas are really popular in Ireland and England, but in Australia and New Zealand they are even more popular. My husband really likes them, so I usually make them for special occasions and parties. They never last very long in our house. Thanks for this clarification, Ashlee and a big thanks to New Zealand for creating this amazing dessert. Unfilled pavs can be stored in an airtight container in the freezer!..just take out about 1/2 before serving, for a quick, day and yummy dessert. Louise – thanks so much for a great tip. I must try freezing a few for when my sweet tooth strikes after the kids have gone to bed. I’m an Aussie living in the U.S. and found your blog by googling a recipe for mini pavlovas. Always having pavlova growing up I was looking for a mini version to serve my young girls. This recipe is fantastic! We all loved it. 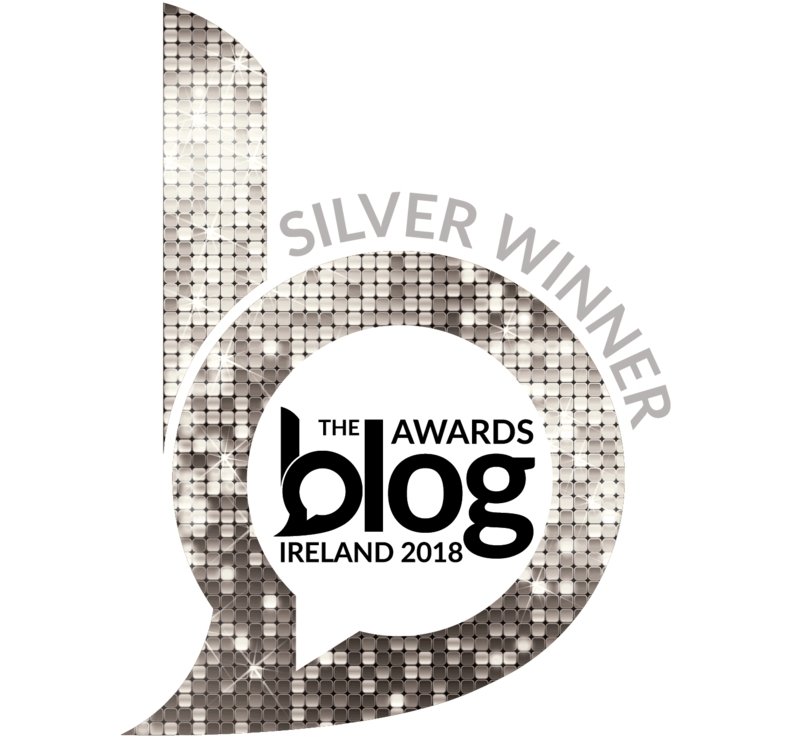 Coming across your site is wonderful; there is similarity between Australia and Ireland, that I never knew — in our recipes. Hayley – So glad my quick and easy mini pavlovas received your family’s seal of approval – that means a lot coming from Australians, where I know everyone loves pavlovas. I think you are correct about the similarities between Irish and Australian food. 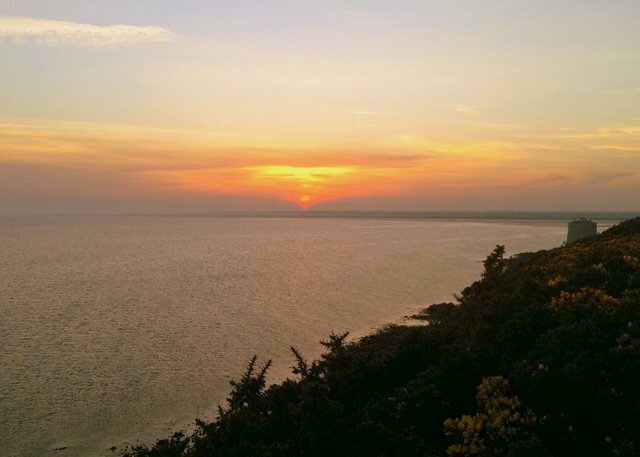 I spent three months in Australia many years ago, and I loved your food – very like the Irish kind I grew up on. My great weakness was Violet Crumbles – they are even nicer than Crunchie bars!!! 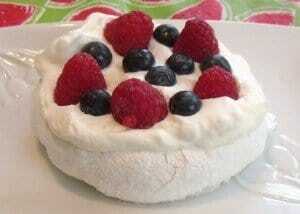 I would love to try your recipe as I have always loved pavlova. My mum is allergic to corn so I can’t use corn starch. Do you think I could use potato starch or just flour as an alternative or would this ruin the consistency and texture? Fiona – I would definitely not use regular flour, since it would totally change the consistency of the pavlovas. I think potato starch is a better alternative. I’ve never used it before, so please let us know if it is successful. Hi, I have made pavlova’s for special occasions and now my friend would like me to make mini ones for her daughters wedding. Do you think I could make the mini ones a bit smaller than the ones you have made. Out of 4 egg whites I would have liked to get at least 24. The big ones I make do also crack but you cover it with cream and you cant see it. However I am scared to make the small ones as it might collapse as I am so slow and will try to make the shape even etc. I have never used a piping bag either and do not fancy that. Also I would like to confirm that it is caster sugar that you are using. In any case I am definitely going to try the recipe. Hi Cynthia – I think these pavlovas should work out just fine if made a little smaller. They may cook a little faster since you will have more surface area exposed to the drying air of the oven. Watch them carefully to make sure they don’t start to turn too brown towards the end of cooking. Caster sugar is definitely what you need. In America I just use regular sugar since it is much finer than Irish sugar. American sugar is as fine as Irish caster sugar. Best of luck as you make these pavlovas for your friend’s daughter’s wedding. You are a wonderful friend to help her prepare for and celebrate her big day. Thanks so much for the encouragement. I am going to make a trial run and will let you know how it comes. I made the first batch of mini pavlova’s and they came perfect. I made half a batch at a time as my oven is 600mm and cannot take the amount of trays I would need for a full batch. I used my daughters oven as it is force fan driven and can take two trays. Was too scared to try three. So I then made the second batch and not sure why, they taste okay look okay but are sticky to the touch. I put it back in the oven on a low heat to dry it out some more but it never made a difference. The only difference with the second batch that I can think of is that I made it the pavlova’s a bit smaller and I had trouble with the egg whites> I had left it out so it was room temperature but the yellow kept on getting into the mixture so took eggs straight from the fridge – would that make a difference? Any thoughts on that. I am not giving up and making another half batch tomorrow. Cynthia – Using cold egg whites at fridge temperature may have affected the amount of air you were able to whip into the mixture, and might have caused them to be sticky. Another problem may be the atmosphere was more humid as you made the second batch. 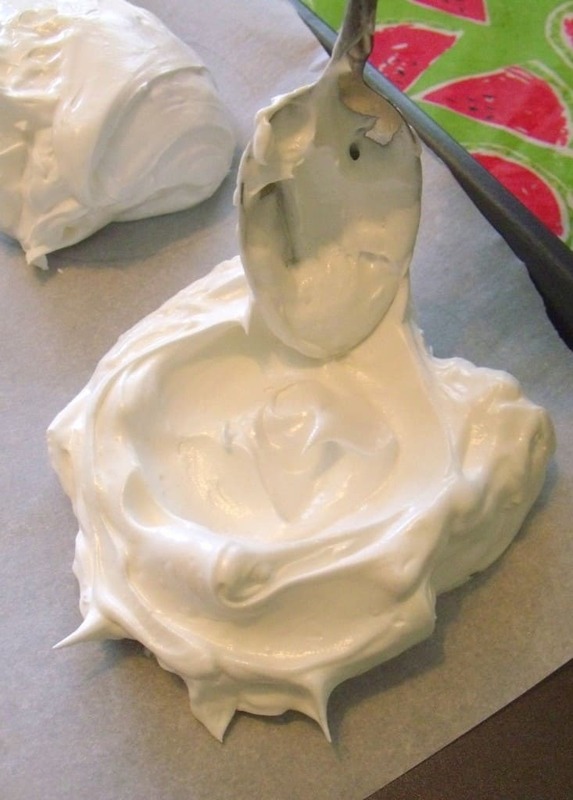 Corn starch is included in the ingredients to help keep the pavlovas from turning sticky. If you want to experiment, you could try adding an extra teaspoon or two of corn starch on a humid day, but I’m not sure if this will make them too dry and cause them to crack. Good luck with your next batch. Thanks for a great tip, Sue. I spent some time in Australia many, many years ago, and I learned how much Australians love pavlova. I have fond memories of many pavolovas I enjoyed during my stay in Melbourne. Thanks and yes it was a humid day but good news. When I checked them this morning in the airtight tupperware, the stickiness was gone. Now I must hope that they will still be okay for Saturday which I am sure they will. I am definitely going to check your other recipes and try them out as well. Thanks again for all the feedback. Regards and well wishes from Cape Town South Africa. P.S. 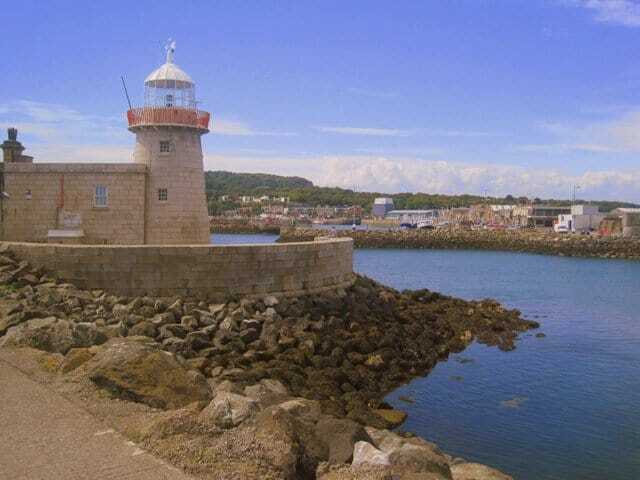 I have been to Ireland, loved it, my niece stays there now and has just become an Irish citizen. My daughter again stays in Dallas and it look like she will be marrying an American. My consolation is that world is so small these days with all the modern technology available. Cynthia – I’m delighted to hear your pavlovas are no longer sticky. Have a wonderful day on Saturday. So happy you had the opportunity to visit your niece here in Ireland and many congratulations to her on becoming an Irish citizen. Like your daughter I found my way to Dallas, Texas for a while. It is an amazing city. 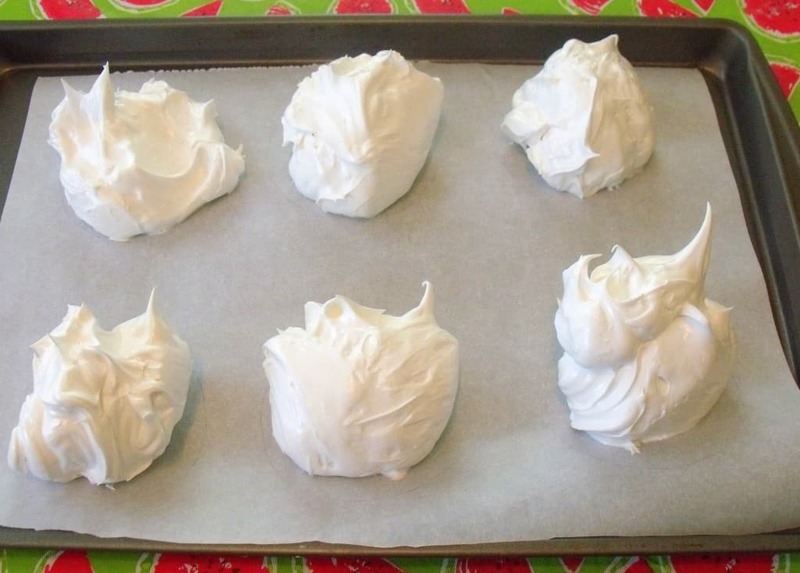 I am planning to make the pavlovas for Christmas – How far ahead of time can I make them and how do I store them? I have to also transport them an hour from home. Thought they would look beautiful with a whipped topping and strawberries and Kiwi chopped on top – very festive. I am so afraid they will break and crumble on transport …thankyou! I too was thinking to give mini pavlovas as a gift but with the cream and all, it seems pretty impossible to hand them to someone without the cream – ??? Thanks and a Merry Christmas! Merry Christmas to you too, Barb. 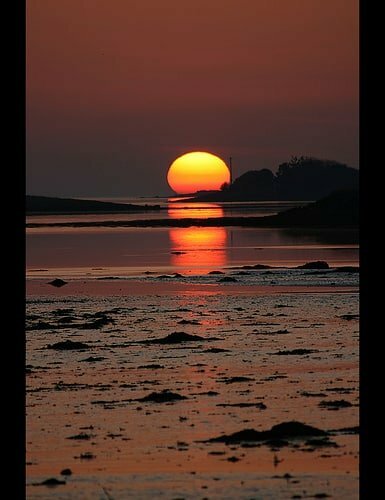 Hope you had a lovely day. Hi Maureen – I hope this pavlova recipe is a great success for you. I find it works every time, and these little desserts are a great ending to any meal and always look very impressive. I’d be careful using this recipe, especially when it comes to the baking time and temp that is called for. I just made these yesterday and they all came out with a hard shell, which you want in a Pavlova but also hard throughout! Basically they were little round bricks of sugar!! This was NOT my first time, nor even my tenth time making a Pavlova (the past ones were all 9 inches) so I know it had nothing to do with my abilities. Also know that the humidity in the air didn’t cause this disaster. As for my meringue. It came out as it always has. Glossy, shiny and thick to the point that if I had wanted to pipe it on, I could have with no issues. Just be aware people…. Thanks for letting us know your difficulties Tammie. I really appreciate it. Sorry to hear they were not a success.